I want you to say a prayer for Jaden this morning. Who is Jayden you ask? He is the son of Sarah Capewell, a mother in Britain who's baby boy was born too early. In fact, had he been born just two days later, doctors would have given him the care he deserved. Instead, based on statistics and numbers, Sarah was told that Jayden's life was not worth saving. The doctors did not care his tiny heart was beating strong or that he was able to breathe on his own; it didn't matter, because a board somewhere who had never met Sarah or Jayden, decided that her baby was not worth saving, nor could the costs be justified in their public medical system. Jayden is a beautiful baby boy and his mother loved him so. I know his mother loved him...I also know the torture and horror and hope she had. I know EXACTLY how she felt the second her son was born. I know the screams and begging in her head as she wondered his fate over the first few hours of his life. But, there is a part of her story I don't know; I don't know what it would have felt like to have to doctors refuse my child care. This is my daughter. 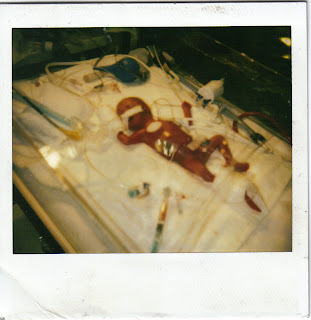 She was born at 22.5 weeks. She weighed 1 pound 3 ounces. Her eyes were still fused shut; she was like a puppy. She opened them more than two weeks after she was born. Thankfully the wonderful nurses documented it for me. It figures, she has always been hard to get along with! She just couldn't open her eyes while I was there, but during one of the few times I went home to steal a nap. I will never forget sitting there for 15-18 hours every single day....just willing her to live with my mind. 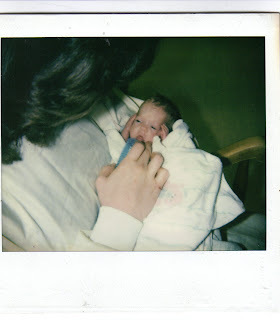 This was the first day I held her January 1, 1992, almost two months after her birth. The doctor told the nurses he thought I might be ready to jump off the roof-top if I didn't get to hold her, even just for a few minutes. 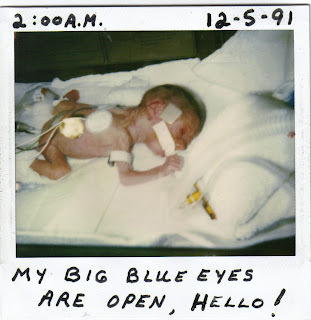 I had seen so many other mothers come through the NICU at that time. Their babies were a little bigger, a little stronger-they could hold and rock their tiny, tiny babies....I could only stick my hand through a portal and touch her hand or foot. It was the most tortuous time in my life. Kelsey was strong and oh so bullheaded. I always knew she would live-even though they told me she likely wouldn't make it three days. She had few physical problems-even though they repeatedly told me she would be mentally retarded or have Cerebral Palsy; she would never live on her own or care for herself. 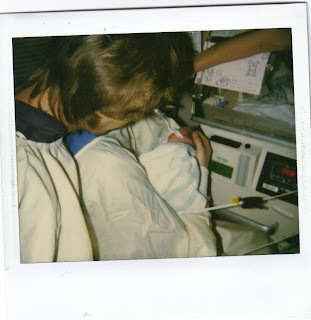 She finally went home the very day before she should have been born-March 3, 1992, weighing in at a hefty 4 pounds. She brought with her a warming light and a heart/breathing monitor-I told them no worries, she wouldn't need them-I had become thoroughly schooled and practiced at constantly monitoring her every everything. I took the tools and I used them, but I knew when she was struggling or faltering sooner than any monitor could. I kept her with me all the time. Even now, I know her that way. I know when she is getting sick, before she complains of it. I know every scar on her body. I know which monitors gave them to her. I remember the day they pulled off most of the skin from her left side removing a monitor from her tissue-paper skin. Four months in the hospital. Four months everyday back and forth. Cat-napping in the NICU sitting room. Four months of sleeping so lightly at home, waiting for the dreaded call, "She's not doing well, her numbers are falling and we have the oxygen at 100%. You should probably get back up here." which came 3 times during her stay. All of that was almost 18 years ago. 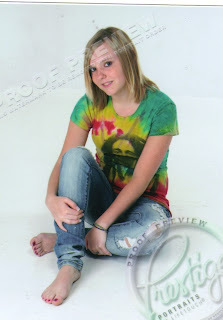 Kelsey will graduate high school this year. She has been the bane of my existence and the light of my life. She is bull-headed and strong willed and one of the two most beautiful young women I know. She is firm in her beliefs. She is absolute in her determination. She is my daughter and I can't imagine a life without her in it. You cannot legislate and bureaucratize health care without making unfathomable choices. You can't make decisions about who to save and who to let pass based off of facts and figures. When Kelsey was born she was one of 5 (at that time) born at that hospital, that soon, who lived. She was the only one of the 5 with no significant medical problems. She beat the odds and the statistics. She is a person who deserved a fighting chance just like anyone else. In Britain, 18 years ago, they would have let my daughter die. This is a truly awesome post and should be required reading for every member of Congress. Michelle, keep up the good work.